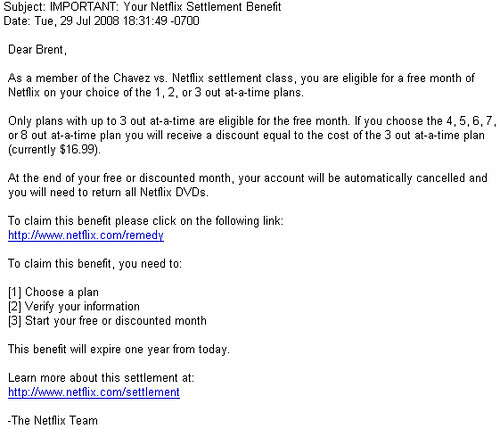 Remember That Netflix Class Action Lawsuit "Chavez vs. Netflix" where a bunch of Netflix users were eligible for a free month of service from Netflix? Well this e-mail arrived for me in my e-mail inbox today. If you get one of these emails, you'll be able to get a free month of service right away. It will be one, two or three DVDs at a time depending on your plan at the time of the lawsuit period. I had a three out at a time so I chose 3 DVDs at a time of course. Here's a few observations from the "settlement benefit"
You get a break on pricing if you pick 4 or more. 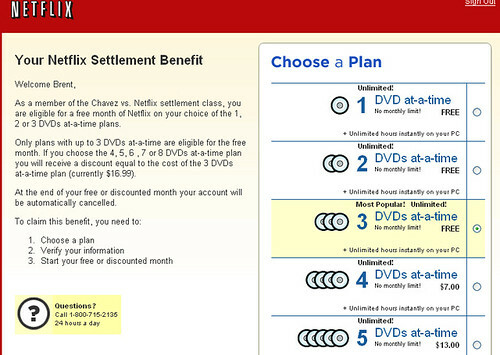 What I mean by that is that it normally would cost you $8.99 per month for a single DVD at a time (unlimited), but since with the settlement you get the discount for the extra DVD plan rates it's only $7.00 for that fourth DVD. I don't have time to watch that many movies, but I guess it could be a deal for some of you. 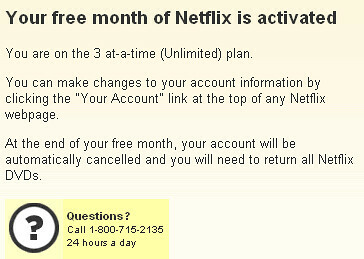 Netflix will automatically cancel your account at the end of your free month. I'm sure you'll have the option to continue the service, but normally they would automatically renew for you each month so this is special to the settlement. It appears to me that those on their free month will in a be lower priority for new releases versus other customers (aka throttling). My test of this was easy since I have an existing account under my wife's name. The test movie was Penelope (no wise cracks on the movie choice :). Check out this screen-shot from the settlement account (I've not used this account for a long time) - notice it says "Long Wait. Now check out the same title on my active (non-settlement) account. It shows that same movie as Available "Now"
The settlement "benefit" will be available a year from the time you receive your e-mail. Looks like my wife and daughter will have some movies to watch this month as I don't have much time for that, but its nice to have a few free DVDs regardless. 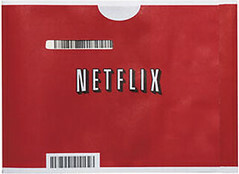 I've been a long-time Netflix customer and will be in the future as well so they'll get their money back from me.